Darrius Heyward-Bey enters his first training as a member of the Indianapolis Colts looking for one thing—establishing trust with Andrew Luck. How exactly DHB goes about gaining Luck’s trust will come each afternoon when the Colts hit the practice field. As the Colts hit the field Sunday afternoon for the first practice of the 2013 campaign, DHB was one of the first players out there. The sound of the jugs machine was being ramped up with DHB taking reps 20 minutes before the special teams portion of practice started. On the back of DHB’s shirt was the “hoist it” mantra that the team has adopted in an effort to hold the Lombardi Trophy up come early February. Having never experienced the playoffs, DHB is anxious to hopefully have his season extended past the new year. When DHB hit the free agent market this past offseason he wanted to find a place with a winning culture. The Colts fit that bill and the five-year wide receiver is now apart of an organization that has high expectations year in and year out. “Just the way they do their business around here,” Heyward-Bey said of what made him choose Indianapolis. 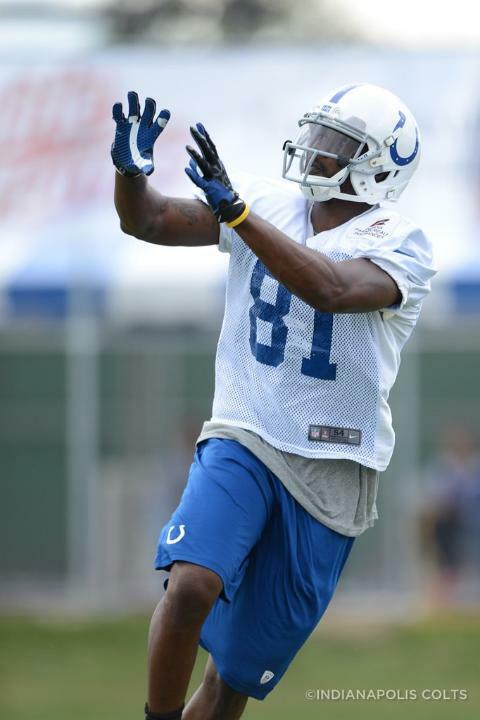 Check back with Colts.com later in the week for another camp update from Darrius Heyward-Bey. Here was a one-on-one interview from DHB after Sunday morning’s walk-through practice.